Last year, I stumbled across the splendid Dark Beyond The Stars anthology - in fact you can read my review of that smashing collection here - and I wasn't aware at all that there were more anthologies following in its wake until I saw Jennifer Foehner Wells tweeting about a discount weekend. Duly spotted, duly bought. There are two successor anthologies to that collection - Beyond The Stars: A Planet Too Far (lined up on my Kindle for future) and this one, At Galaxy's Edge, which puts the focus squarely on space opera. Jennifer Foehner Wells - who featured in that previous anthology - also returns to provide a foreword. One notable difference from the off is that previous collection was an all-woman anthology, bar editor David Greenwood, whereas this collection is a mix of men and women, each spinning their story universes. This collection has a heady brew of tales too - straight out of the gate we have a tale that author of A Boy And His Dog, Harlan Ellison, would approve of, though this time about a marine and his modified K9 unit. The pair are assigned to investigate a terraforming project gone wrong. It seems routine, it seems like little more than an excuse for the dog to frolic among the new green - but they're very wrong, as things take a turn for the worse. The Good Food is by Michael Ezell, and I really like his style - he'll definitely go on the list for authors to keep an eye on. That set the tone nicely for a good selection of tales. David Bruns' The Epsilon Directive is very much a story asking where you draw the line in following orders, and where personal choice has to come to the fore. Chris Fox conjures up a fun expedition into space archaeology with the added threat of arms being pulled off. There are a couple of disappointments in here - I found Just An Old-Fashioned Lust Story by Christopher J Valin to strain the suspension of disbelief with its tale of bounty hunters killing one another under the manipulation of a three-breasted beauty, while Piers Platt's Last Pursuit was going just fine until it ended all too soon. There were three real stars in the collection for me, though - Adam Quinn's Procurement packs so much world building into its short tale of an emergency service for the stars struggling through the perils of bureaucracy that it feels like a whole movie packed into its length. Brilliant. Nick Webb's Second Place could sit down and share a beer with the stories of Ray Bradbury, as it captures the home-spun drama of the second man to set foot on Mars, who hopes to become the first man to die there. The character work is fantastic, and it just feels like a wonderful, comfortable walk alongside the story's protagonist, as he sets about a landmark few would want to achieve. But perhaps the story I salute the most is Anthea Sharp's One More Star, Shining. Inspired by the real world horrors of the Pulse shooting in Florida, she creates a universe of miners and those trying to outrun their dreams, all caught up in a moment of horror when an attack shatters the mining community. What makes the story so worthwhile is how it attempts to approach such horror, and examine the ways in which people deal with it. There is the horror of hope as you wish the pain would visit someone else, someone you don't know. There is the aftermath, and the attempt to understand how you can go on, and what is important. And for that, crafted in a short tale in the stars, Anthea Sharp deserves much credit. Overall, the collection doesn't feel quite as strong as Dark Beyond The Stars - but that was a high bar to set, and it's not far behind. Series editor Patrice Fitzgerald is to be commended. 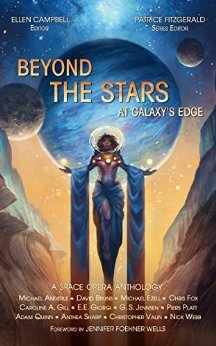 Beyond The Stars - At Galaxy's Edge is available on Amazon. This was one of those stories you see passing through your social media feed. I caught sight of it when a fellow reviewer shared it and recommended it, so I took him at his word. It's the story of an imprisoned soldier, whose walls are measured out by memory, the distance to the dirt and soil, the limited light he has to see by, the years that have been engrained in his head as they tick by, one by one. I've not read anything by A L Wright before - so this made a good introduction. I wasn't sold on some of the sexual elements in the story, but that's really just personal taste, this still makes a good read, and one that probes the inner psyche as much as the world in which the trapped soldier walks. 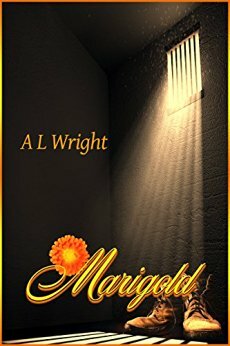 Marigold is available on Amazon.